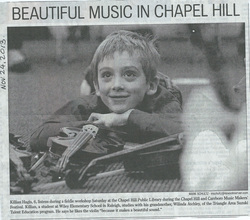 Community Day, Saturday, November 23, involved many local teachers and students at the Chapel Hill Public Library. The discussion with speakers gave us an insight into the role Chapel Hill has played in cultivating an atmosphere to nurture the arts. Watch out for a more in-depth Forum in March. 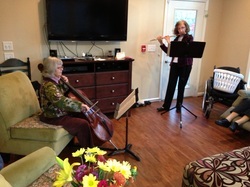 Donna -flute and Jane -cello at the Charles House Yorktown. Senior Outreach, Sunday, November 24, brought joy to housebound seniors, thanks to the groups who performed for them. It was such a welcomed event for them that we are planning to reach out with more performances during the year. The Two Piano Four-hand players at the Carol Woods performance.